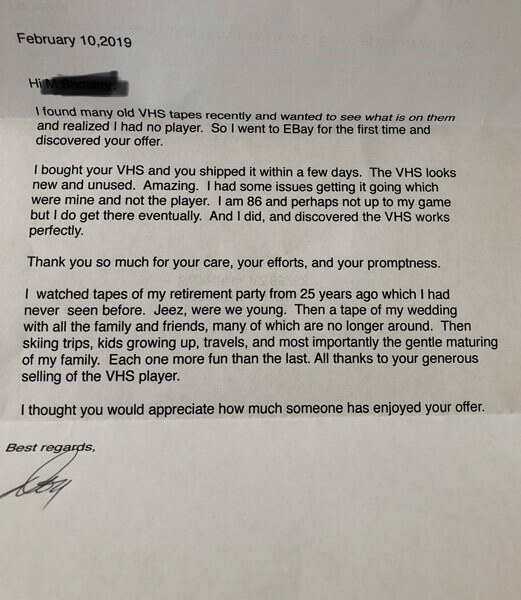 Elderly man sends thank you letter to VCR eBay seller. Report from 6abc.com on February 19, 2019. PHILADELPHIA (WPVI) -- A simple act of selling a VCR online has changed the lives of two men who are from different generations and live more than 1,000 miles apart. Matt Shoukry says he does not even remember the exact VCR he put up for sale on eBay that is now making him a viral star. "Most eBay transactions are a blur for me as most commerce is nowadays. They pay. They get their item. Everybody's happy and goes on their way," Shoukry told 6abc.com. But there is a good reason for his lack of memory when it comes to eBay. 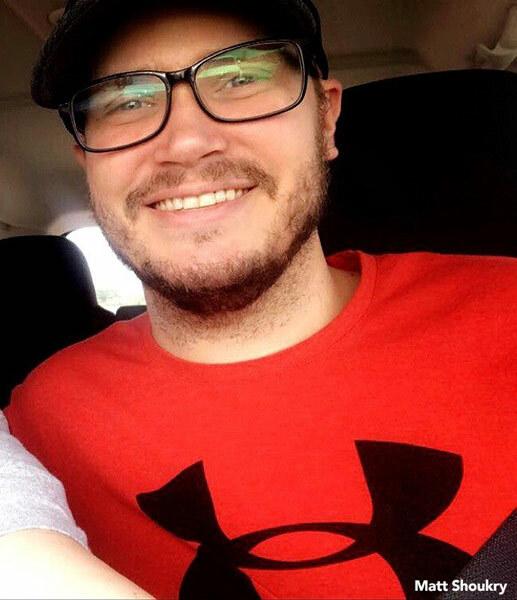 The 31-year-old St. Louis man has been selling a lot on the auction website recently. And it began out of necessity. Last year, Shoukry was diagnosed with cancer. He says he was unable to keep a job he would normally do while he was being treated, so he turned to eBay. That's where he found his niche. "While sick, I was stuck on the couch a lot and I started selling on eBay to help make ends meet as it was something I could do from home without too much bodily stress," Shoukry told 6abc.com. After surgery and treatment, Shoukry says he's "all good now." And though his health has improved, he stuck to selling professionally on eBay. And one of those items he sold was a VCR (or VHS player). There is a spot in South Philadelphia that is an anachronism. 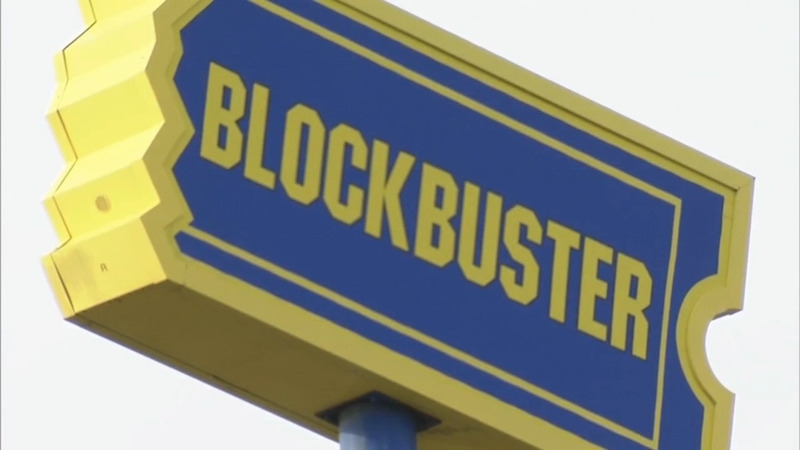 It's a relic of a recent past that represents a tradition no longer relevant to most. It's an indicator of a simpler era where a night staying home began with an outside destination. Like all the other transactions, Shoukry thought once the player was bought, that was the end of the story. But a letter that came in the mail Saturday made it clear that this story was far from over. "My girlfriend had brought the mail in, which is usually all ads and junk, but I noticed a letter for me with a handwritten address on the front," Shoukry said. I found many old VHS tapes recently and wanted to see what is on them and realized I had no player. So I went to EBay for the first time and discovered your offer." Shoukry says once he began reading the letter, he couldn't put it down and had to tell his girlfriend. "We were watching the Blues hockey game at the time, and one line into his letter, I immediately paused the game and had to share it with her," Shoukry said. "I bought your VHS and you shipped it within a few days. The VHS looks new and unused. Amazing. I had some issues getting it going which were mine and not the player. I am 86 and perhaps not up to my game but I do get there eventually. And I did, and discovered the VHS works perfectly. Shoukry and his girlfriend were overcome with emotion while reading the words of the 86-year-old stranger who was reconnecting with his past. "We were both on the brink of tears reading it and I had to share this gentleman's story with more people," Shoukry said. So Shoukry shared the letter in the proper place one would take such a charming and extraordinary finding - reddit, where he wrote, "Got this letter today. It doesn't get much better than this." Needless to say, it didn't take long for the letter to trend across social media with readers feeling the same emotional bond Shoukry and his girlfriend did toward the unknown gentleman. But the story once again does not end here. Shoukry says he plans to reach out to the man again. This time with an offer to secure his beloved, delicate memories better than any VHS could. "I will be offering to allow him to ship his VHS tapes to me so I can digitize them. That way, his family memories will be safe and not at risk of deteriorating away on those tapes, and the rest of his family for generations can enjoy the memories, too," Shoukry said.